What a way to end 2008, a massive, incredible and stupendous turnout of 562 runners. 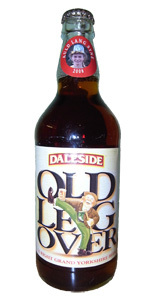 With so many running we nearly ran out of the popular Daleside 'Old Leg Over' beer, but luckily just had enough! The sub zero temperatures made everything look magical, with a heavy dusting of frost everywhere, this wasn't only on the scenery by the finish, because runners finished looking like ice sculptures, just see the photos. Andi Jones the 2006 winner was in mean mood, and never gave Olympic athlete Alistair Brownlee and brother Jonathan a snowball in Hells chance! But to be fair Chevin Chase winner, Alistair, didn't do himself any favours by within the first 200 yards going off route, much to the amusement of everyone else. 17 year old Blue Haywood made a welcome return to the fells, and her hunting ground of Penistone Hill, by winning from Karen Pickles and Stoop winner Sabine Hauswirth. Due to the wintry conditions records tumbled in age groups everywhere. The Spring issue of the Fell Runner magazine will feature an in depth article about the event, and some of the runners. A special thanks and mention must go to all the hardy souls who braved the elements to marshall, register, time keep and record all of you, - without them races just wouldn't exist! The traditional Scottish pipe music was provided by young Ilkley Harrier Calum Carslaw. Paul's photos on the way out... and on the way back. FRA Forum thread (watch out, 2008 starts on page 6). Dave has drawn a Google Map of the course.